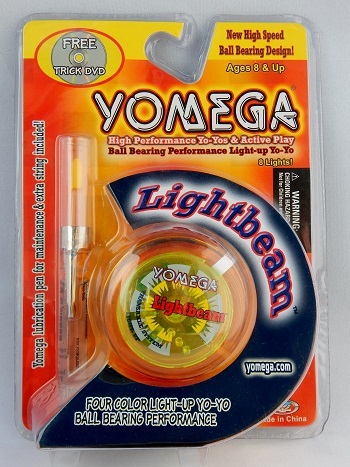 The Lightbeam, released in 2007, was Yomega's next generation light-up yo-yo after the Yomega Strobe Yo from 1999. The Lightbeam had eight, four-color LED lights that change color and pattern as the yo-yo was spinning. The body is identical to the Yomega Raider and Yomega Fireball. Used a size A (Duncan standard size) ball bearing axle with a starburst for response. Also came with a Yomega lubrication pen, an extra string, and a Yomega Mania 150 trick instructional DVD. Original retail price: $40. Besides a translucent orange body with translucent yellow caps, the Lightbeam also came in a translucent blue body with translucent yellow caps, and all translucent yellow version. Original retail price: $14 US.